When you are determined to throw a great event but keep the costs down, the Dollar Store is the way to go. 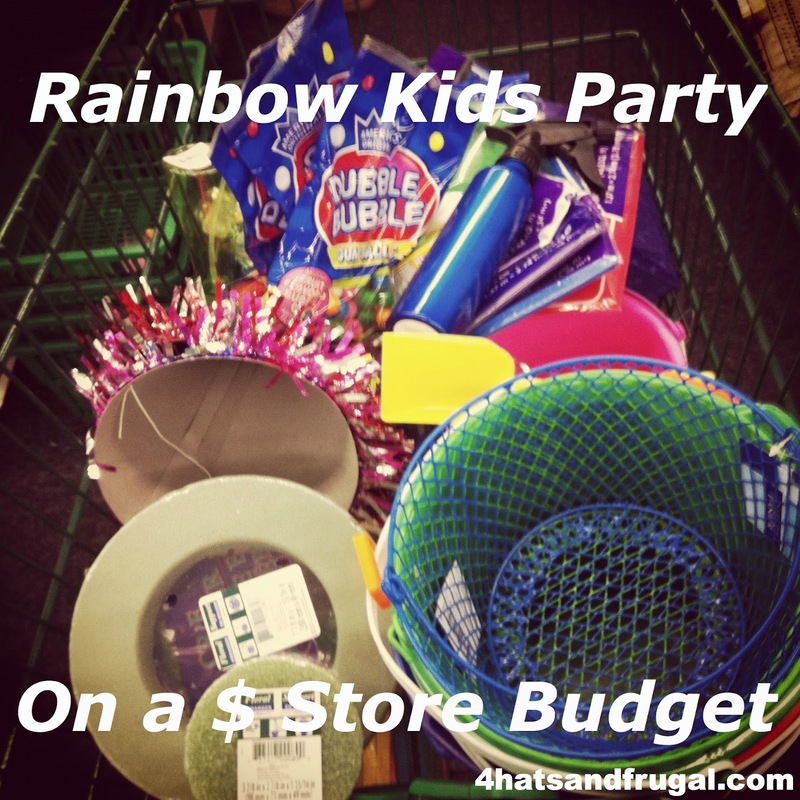 Everyone asked me why I decided on a “rainbow” theme for the kids’ party and go crazy with the rainbow party decorations. The answer was simple: I could find all the colors at the dollar store near me. Plates, games, balloons, hats and even toys for the goody bags were all found in a kaleidoscope of colors right at my local dollar store. P.S.- The invitation isn’t smudged. I photoshopped out my phone number and town :-D.
To start off the theme, I created these invitations through Simply To Impress. 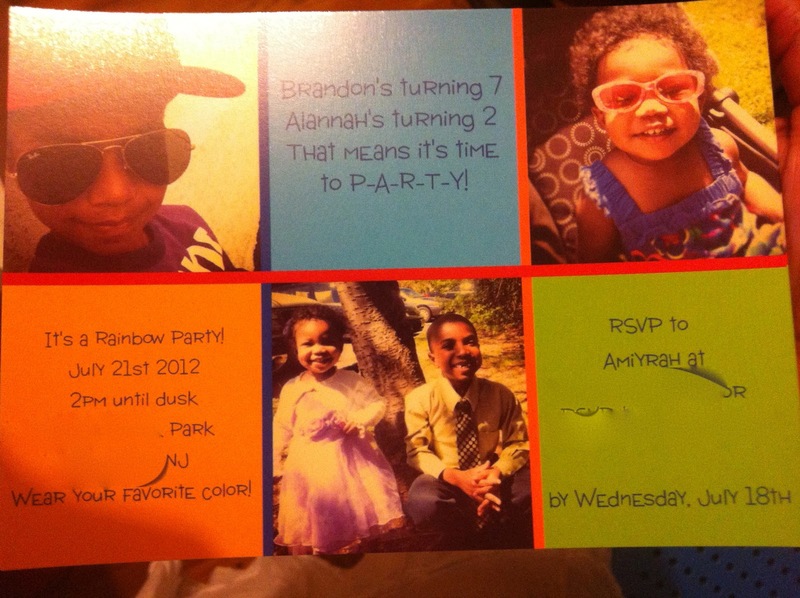 A few months back, Living Social had a deal on invitations from this site and I snatched it up quickly. 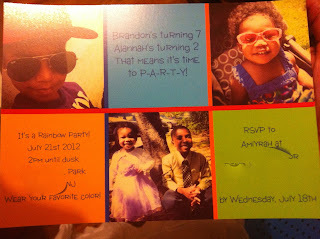 I got 32 invitations for 15 dollars including shipping. They also put in an extra invitation and envelope “in case I missed someone on my invitation list.” Very cool. We had the party at a local park, which gave the kids lots of space to run and be free, and to get out of our hair a bit while being safe. To get the guests excited, I told them on the invitation to wear their favorite color to the party. My thought was, if we had down time in the party, we could get pictures of those with the same love of pink, purple, red, etc. Bowls for the pretzels, potato chips and tortilla chips! This was a genius idea that popped into my mind while at the store. I was looking for big bowls and saw these large buckets just sitting in the toy aisle. The shovels made a great scoop as well, and everyone appreciated that they didn’t have to use their hands or tongs to grab their snacks. I also bought some shower caps and we used those to cover the snacks so the bugs wouldn’t get at them. Awesome sauce. I got a large jug of bubble solution for a dollar and 4 bubble wands as well. The kids loved this part of the party, chasing each other while popping balloons. It kept them occupied while we grilled. There were so many other cute things that we did, but this one got the most “great idea!” responses from our guests and a few of you on my Instagram account. We bought the kids’ wagon from home and housed the non-alcoholic drinks here. It did a wonderful job of keeping the sodas, water, seltzer, and juice boxes nice and cold on that warm day. I also sprinkled some salt on the ice, which lowers the temperature of the ice almost immediately. As each guest showed up, I greeted them with a drink. Above is my white peach sangria I made for the adults. The container wasn’t from the dollar store, but was purchased at Walmart for only 2 dollars. I actually bought two, and made iced tea and vodka in the other container. Both were a big hit and since the peaches, oranges, seltzer and iced tea were on sale at ShopRite that week, it was inexpensive too!